Whirlpool washer flashing the LF error code on the display. The washing machine will not fill with water. Check the water supply valves, water inlet mesh filters, water inlet valve, pressure switch, and hoses for clogs/kinks. 1. Inspect the WATER SUPPLY VALVES on the wall to be sure the VALVES ARE FULLY OPEN and water is supplied to the washer. 2. The WATER SUPPLY HOSES MAY BE CLOGGED from hard water – Remove water hoses and check for clogs. 3. 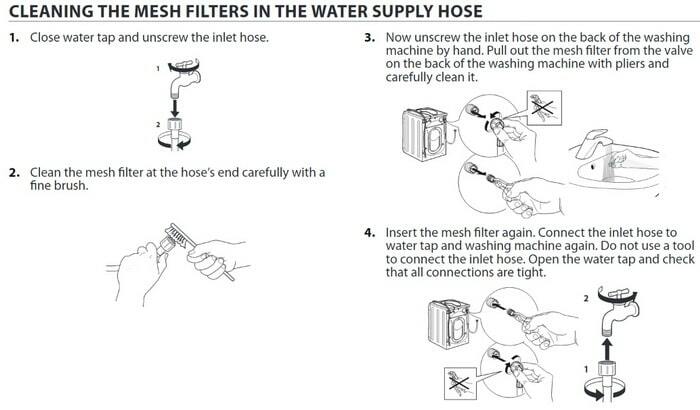 Check that the water supply hoses do not get kinked when you slide the washer back into place. 4. Water supply hoses connected near the wall and washer water inlet valve have WATER INLET MESH FILTERS. These filters filter out foreign objects in the water and may have sediment buildup. If sediment is clogging the filters, they need to be cleaned. 5. If water is entering the washing machine but not detected, the WATER LEVEL PRESSURE SWITCH may be faulty or clogged. 6. Check the WATER INLET VALVE on the washer – If faulty you will need to remove and replace. 1. Check the DRAIN SYSTEM FOR SIPHONING issue. 2. If in cold weather, check WATER SUPPLY HOSES FOR FREEZING. 3. Check the MAIN WATER SUPPLY to your home to be sure it is FULLY OPEN. NOTE: This LF error code clearing method will work with Whirlpool and most Maytag and Kenmore washing machines. The same LF error code occurs on both top and front load washers. Some of the components in the washers may differ slightly but the error code clearing method is the same. MORE ERROR CODE INFO – Whirlpool Washer Error Codes – What Does The Error Code Mean? 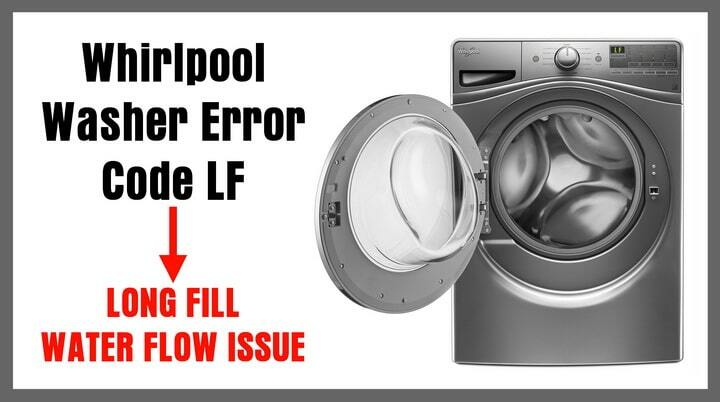 If you need assistance with the Whirlpool washer error code LF, leave a comment below with your washer model number and we will assist with troubleshooting the problem. I get a LF code, I’ve replace the cold water valve, the pressure valve switch and all hoses. Any ideas what else it could be? I am getting water into the tub, that’s not the issue. It will work with hot water only, sometimes. Next post: Samsung Refrigerator Randomly Beeping – What Causes Alarm Beeps?